It’s January. I don’t know about you, but it seems like everyone around me is sick, getting sick, or getting over being sick. From people at work to kids in the library to shoppers in the mall, why don’t these people just stay home? But since they won’t, we healthy folks need to tend to our immune systems. Extra vitamin C, extra rest, extra hot lemon tea, extra greens, extra whatever it is that makes us feel healthier. And mushroom soup. I was pleasantly surprised that instead of tasting thin and medicinal, this soup is hearty and delicious, more like a stew. Even my mushroom-soup-wary husband likes it. Originally the recipe called for only shitake mushrooms. Because shitakes are strongly flavored and expensive, I substituted half button mushrooms. You could try part crimini mushrooms if you like. Shitakes have higher immune boosting properties than most ‘shrooms, so do include them in the mix. 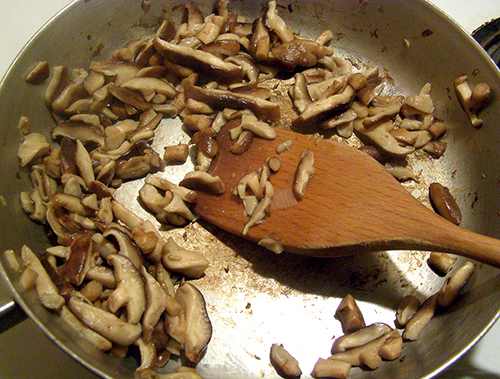 Don’t skip the step of frying up the mushrooms in two batches and deglazing the pan, then adding both to the pot. The broth won’t be thick and delicious if you just throw the mushrooms in with the other veggies. Wishing you and yours a happy and healthy winter. If you have favorite (noncommercial) tips for boosting our immune systems, please post them in a comment below. In a deep soup pot, sauté onion in 1 tbsp. olive oil with sea salt over medium heat until tender and golden, about 5 minutes. Stir frequently. Add garlic, ginger, carrots, and celery, and sauté for another 3 minutes, stirring to cook veggies evenly. Add 4 cups of broth to pot. 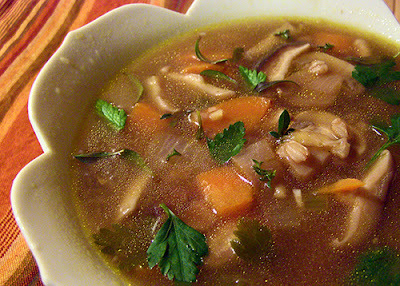 Stir in wine, rinsed barley, thyme sprigs, and ¼ cup parsley. Bring to boil and reduce heat to medium. Simmer until barley is barely tender, about 30 – 40 minutes. 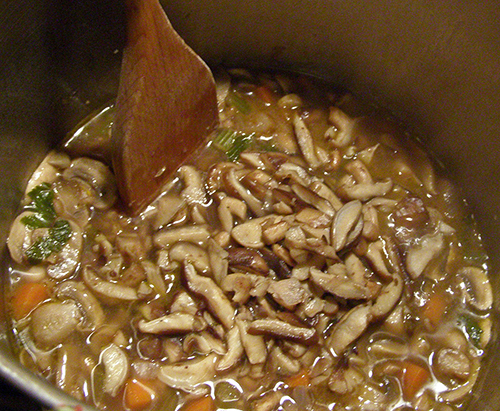 While soup is cooking, sauté mushrooms and add them to the pot. Sauté each type of mushrooms separately, or if using all shitakes, divide in half and sauté in two batches. Using high heat, add ½ tbsp. olive to a skillet and sauté mushrooms, stirring constantly, till juices are released and evaporate. It’s ideal if the mushrooms sear, but not all mushrooms will do this. Transfer cooked mushrooms to pot. Deglaze skillet with ½ cup reserved broth. Add deglazing mixture to pot. 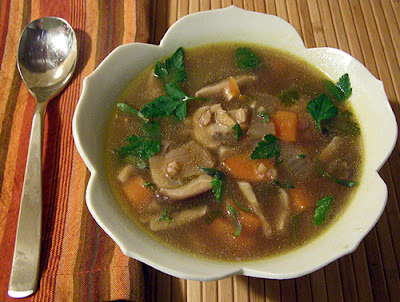 Repeat sauté and deglazing steps with remaining mushrooms and broth, adding both to the soup. When barley is tender, stir in tamari—about 5 minutes after you’ve added all the mushrooms. Serve garnished with fresh parsley and thyme leaves. To your health!